Author Jon Bonné is the award-winning wine editor of the San Francisco Chronicle. He arrived in Seattle from the East Coast in 2000 where he began his wine writing career and settled in California in 2006. After reading this book I wasn’t sure what “New California Wine” was exactly. From a Pinot Noir writer’s perspective, I assumed it meant wines that were crafted with earlier harvested fruit and resulting lower alcohol percentages, that were void of winemaking shenanigans, and that were more reflective of terroir. In other words, a more “subtle and deliberate touch as opposed to full-flavor.” Bonné attempts to be an arbitrator of taste in this book and lambasts California’s producers of “Big Flavor” wines which he infers are passé to serious wine lovers. The implication is that Big Flavor has retarded the ascent of Pinot Noir into the realm of significance. Not so fast! Bonné singles out Sea Smoke, Loring Wine Company, and Aubert as examples of Big Flavor Pinot Noir and cruelly lambasts Kosta Browne as “the ultimate example of irrational exuberance,” while implying that only novices are fans of these “brash” wines which lack terroir expression. Brash is a contentious word, defined as “vulgarly self-assertive,” and I respectively take exception to its use in this context. I get the notion that Bonné has not tasted the full lineup of Kosta Browne wines in recent vintages. I have. The more current Kosta Browne wines are considerably more refined and stylish than those offered in the mid-2000s and definitely show no lack of terroir expression. I can easily separate the Kosta Browne offerings of Keefer Ranch, Koplen Vineyard, Rosella’s Vineyard and Pisoni Vineyard based on my extensive experience of tasting wines from these distinguished sites. I like to describe the rich Kosta Browne wines as analogous to “bombs bursting in the mouth,” or as Michael Browne is want to call them “rock ‘n roll wines.” They are delicious examples of California Pinot Noir produced with a clear vision of the winemaker’s intention and they have a huge dedicated fan base. Reportedly there are 35,000 people on the Kosta Browne waiting list eagerly trying to buy some of this so-called “brash” wine. I agree with Brian Loring of Loring Wine Company who thinks that it is dangerous to create a style or cultural war when it comes to wine. As Adam Lee of Siduri Wines points out, it is bad for the wine industry. There should be no questioning the motivation of winemakers like Brian Loring and Michael Browne. They resent the implication that they are making wines to get high scores from certain reviewers and not making wines that are based on terroir. The truth is, most artisan Pinot Noir winemakers strive to make wines that reflect the terroir of the sites they work with and they often succeed. Bonné may not agree with the results, but their passion and dedication is every bit as ingrained and admirable as the winemakers that Bonné reveres. I absolutely love Ted Lemon’s Littorai wines (Ted is featured on the cover of the book and referenced extensively within the pages of the book) and I have the utmost respect for him, but his wines are not low alcohol, delicately flavored wisps, but rather beautiful expressions of California Pinot Noir made in his vision. Calera Wine Company appears prominently in the book as well, but it is hardly part of a new California generation, having celebrated its 35th vintage with the 2005 wines. Some of Calera’s 2009 vintage Pinot Noirs clock in at 14.8% and 14.9% alcohol. Generalizations are always difficult when applied to wine styles. Now that I have that off my chest, let me comment further about the book. 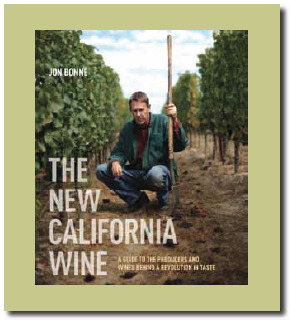 Bonné does a credible job in Part 1 of the book, “Searching for the New California,” relating the complicated evolution of California winegrowing and winemaking post-Prohibition. I know of no other book that provides this information in such a succinct yet comprehensive fashion. Part 2, “The New Terroir: A California Road Trip,” is less successful. Several key winemaking regions are detailed in a historical and current context, but a number of important regions are omitted including Mendocino County, Carneros, Marin County, Santa Lucia Highlands and Monterey, and Santa Maria Valley (Santa Barbara County is included but there is only brief mention of the Santa Maria Valley). In Part 3, “Wines of the New California: A Guide,” Bonné only includes very personal choices that are suitable to his palate. There are so many notable wineries omitted that those included are nothing more than the author’s personal agenda. Even among those wineries chose for inclusion, there is too much significant diversity in stylistic expression to neatly categorize them in the “New California” grouping. Wineries listed such as Littorai, Longoria, Calera and Ridge have been making wine for decades without significant changes in their winemaking style, yet the press, in reviewing this book, implies that the book offers a comprehensive coverage of California’s “new generation.” Some of Bonné’s guardians of “New California Wine” such as Pinot Noir producers Domaine De La Côte, Ghostwriter, Lost & Found and Vaughn Duffy, have only a couple of vintages under their belt and although novel, are unproven with little stylistic ideals evident. There are a two minor inaccuracies in the book. Williams Selyem’s early winery was in a leased garage in Fulton on River Road, not in Graton as is stated in the book. Williams Selyem moved to the Fulton garage in 1983 and remained for five years before relocating to Allen Vineyard on Westside Road. Regarding Dijon clones of Pinot Noir, Bonné states, “In 1987 and 1988, Oregon winegrowers and their counterparts at Oregon State University persuaded Raymond Bernard to share genetic material he had isolated in Burgundy.... nicknamed the Dijon clones.” In truth, according to David Adelsheim, Dijon Pinot Noir clones 113, 114 and 115 and Dijon Chardonnay clones 76, 95 and 96 were brought legally into Oregon from Dr. Bernard initially in 1984. Dijon Pinot Noir clones 667 and 777 were sent to Oregon in 1988 and all the Dijon clones were shared with FPMS in California in 1988-1989. I believe wine critics should hold to a responsibility to separate personal stylistic preferences from an objective assessment of wines. In other words, try to reward wines for their excellence regardless of style. It boils down to distinguishing between appreciating and liking. As one wine writer noted, “If the style is not one of my favorites, I hope I have the generosity to appreciate what the winemaker set out to accomplish.” Another respected wine writer, Charles Olken, recently said, “The wines of Kosta Browne, Paul Hobbs, DuMOL and Dehlinger are lovely, rich, deep interpretations of Pinot Noir....They are not raisined or sweet or simple. They are authentic, real and wholly enjoyable. There is simply no calibration for taste.” I agree wholeheartedly. The New California Wine, Jon Bonné, Ten Speed Press, Berkeley, hardcover, 298 pages (including vineyard maps), $35.